The Demilitarized Zone (DMZ) crosses Korea in the middle of the peninsula. 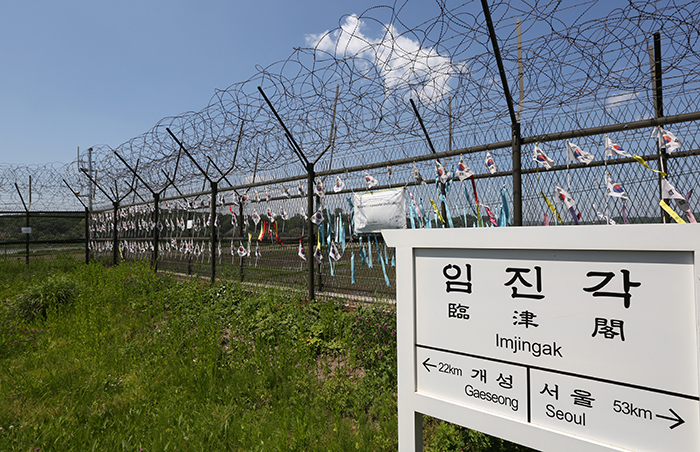 As a border that cuts the peninsula roughly in half, into northern and southern parts, the DMZ is heavily armed and a strictly limited place for the public. 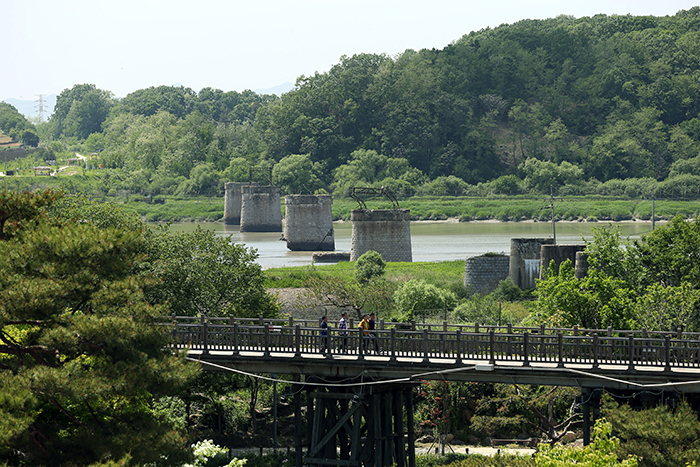 Earlier this month, however, KORAIL launched its DMZ Train, a trip that delivers travelers to the heart of the limited-access region. Opened less than a month ago, the train is attracting a growing number of travelers, both domestic and international, bringing them to this land of military and mystery. The DMZ Train uses the Gyeongui railroad line that connects Seoul to Paju in Gyeonggi-do (Gyeonggi Province). It is one of many symbols of Korea’s separation. Opened in 1906, trains along the Gyeongui Line travelled about 500 kilometers from Seoul to Sinuiju, on the banks of the Amrok River (Yalu River), via Gaeseong (Kaeseong) and Pyongyang, now in North Korea. Linked with the Gyeongbu Line that connected Seoul to Busan, trains along the Gyeongui Line could diagonally cross the whole peninsula from southeast to northwest. Before the nation’s division, the train was also connected to the Trans-Siberian Railway, allowing people to get to Europe. After national division, however, the train stopped operating in 1951. In 2000, South Korea and North Korea held an inter-Korean summit where the two sides agreed to restore the Gyeongui Line. The restoration made it possible to extend railroad service from Munsan Station, the previous final station, to the newly established Doransan Station. This is now the last stop for the DMZ Train. The DMZ Train has three cars, each designed with a different theme and with a different message. The Peace Car has a rusty steam train motif that is a symbol of the separation of the peninsula. The Harmony Car is covered with images of red and blue human figures holding each other’s hands, while the Love Car has adults and children from across the globe holding hands. 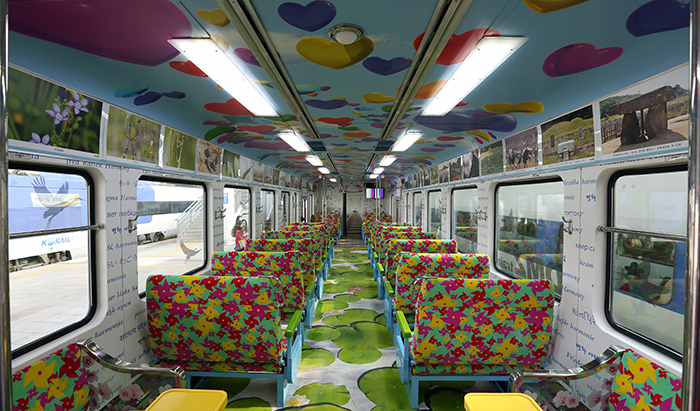 In all three cars, the ceilings are covered with images of pinwheels and the walls with photographs of the DMZ, focusing on the themes of war, trains and ecology. The train takes about an hour and twenty minutes from Seoul Station to Dorasan Station. Passengers leave the capital’s countless high-rises behind and see more and more green out the windows. After brief stops at Neunggok Station and Musan Station, the train pulls over at Imjingang Station. It’s necessary for all passengers to detrain for a while to identify themselves and be given a tag to hang around their neck. Once they are approved to enter the DMZ, they can get back on the train again. Out of Imjingang Station, the train starts moving northward again. While running on a railroad surrounded by fences on both sides, the train suddenly slows down. A screen installed in the train shows the appearance of a tiny, baby Asian water deer. Frightened by the train, the animal jumps to the left and right, back and forth. 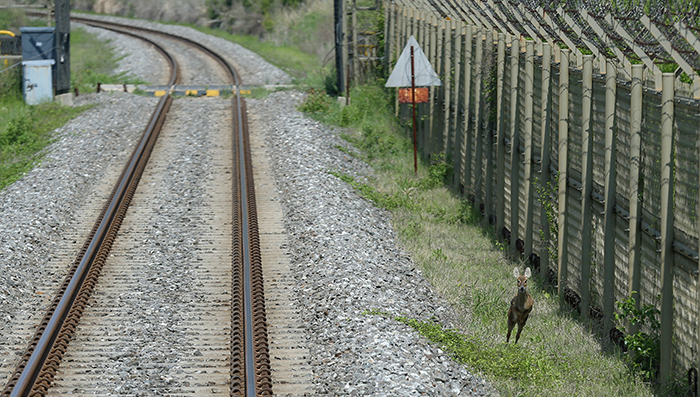 The generous conductor waits for the baby deer to pass behind the train. After a while, the train enters onto the Imjingang Bridge with a clunk. A number of people onboard say they feel butterflies in their stomach at that moment, imagining the railroad to the north would open. A background song featured in the film “Taegukgi: The Brotherhood of War” (2004) reverberates inside the train. Soon, an announcement comes over the loudspeakers informing people of their arrival at the final station, Dorasan. “Dorasan Station is currently the last station toward the north, but will eventually be the first station in the north,” said a rail attendant. Among train stations nationwide, Dorasan Station is the only international station, reflecting the hopes of the Korean people for a successful reunification. Reunification would also achieve the current administration’s “Eurasia Initiative,” a plan to allow people to go through the middle of the peninsula and beyond to Russia, China and Europe. Travelers at Dorasan Station can either look around the Dorasan Peace Park and the Dora Observatory or purchase a ticket to visit the underground tunnel. Opened in 2008, the peace park has beautiful forested grounds designed around the peaceful reunification of Korea, an artificial pond in the shape of the peninsula and symbolic monuments that represent people’s wishes for unity. Visitors are able to walk along the peaceful trails and enjoy the serene atmosphere. Visitors to the Dora Observatory, the northernmost observatory point, can look at North Korea in the nearby distance. Through telescopes installed at the site, visitors can see parts of Gaeseong City, the Gaeseong Industrial Complex and a statue of Kim Il-sung. Via a five-minute bus ride, visitors can reach the third underground tunnel. From 1974 to 1990, a total of four underground tunnels were discovered at General Outposts (GOPs), known to be dug by the North Korean army. The third tunnel, two meters high, two meters wide, and 1.6 kilometers long, was found in 1978 by a Korean soldier. The tunnel is 74 meters underground, about the height of a ten-story building. All visitors must wear a safety helmet before they can enter. Previously, the tunnel was only accessible on foot, but in 2002, an elevator was constructed, making it easier for visitors. The deeper the elevator goes, the cooler the temperature gets and there is more moisture. In the darkness, visitors keep to the right in a carefully moving line. At the end of the tunnel sits three layered concrete walls, along with fences that block the tunnel. From that point, it is only 435 meters to North Korea. After finishing their site seeing around Dorasan, all the train passengers must take the same train on their way out. Out of Dorasan Station, visitors can choose either to go back to Seoul or to continue on to Imjingang Station. A number of travelers opt for the latter, as Imjingang has a lot to offer. The highlight of the trip to Imjingang Station is the steam locomotive at Jangdan Station. It used to go to Sinuiju before separation. 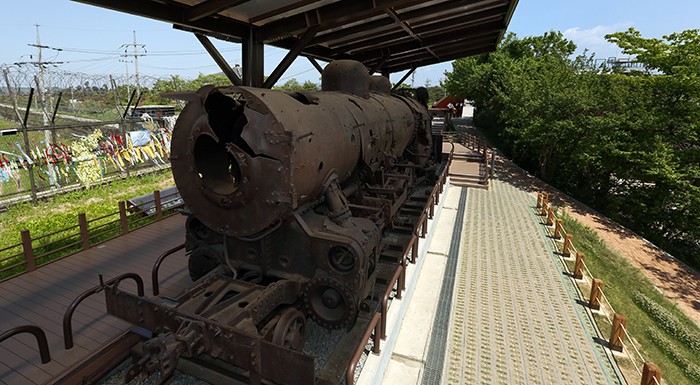 Since being bombed and derailed during the Korean War (1950-1953), the steam locomotive has remained in the same spot for more than 60 years. According to former conductor Han Jun-ki, who was in charge of the locomotive, it was on its way to Pyongyang from Gaeseong, transporting military supplies. However, when it encountered Chinese troops, Han decided to go into reverse and to head back to Hanpo Station in Hwanghe-do (Hwanghe Province), now in North Korea. When the train arrived at Jangdan Station, now in Paju, it broke down. The old rusty locomotive has more than 1,000 bullet holes and the wheels are tilted. A short distance from where the locomotive is on display stand the destroyed legs of a bridge. 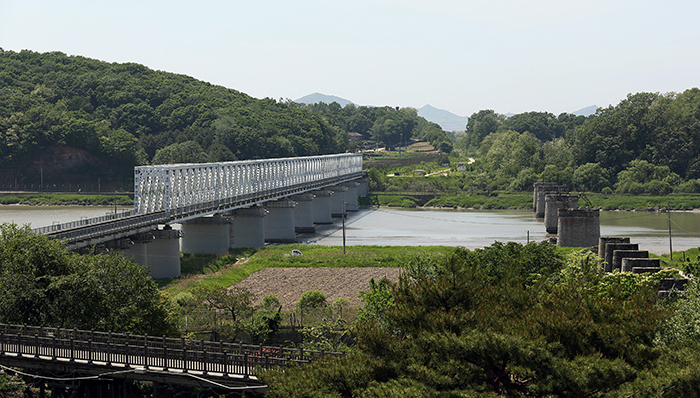 It is one of the two Imjingang Bridges that delivered passengers to and from Seoul. 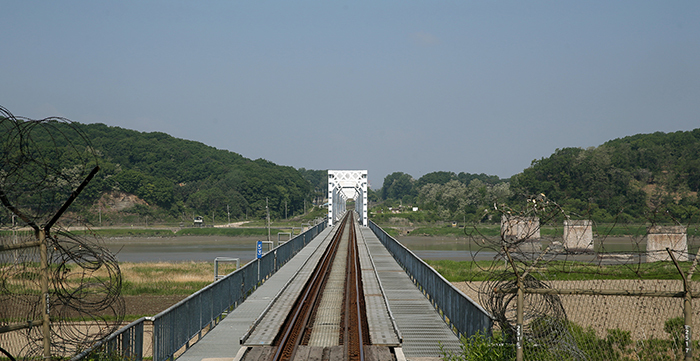 One of the rail bridges, perfectly restored, is used for the DMZ Train, while the other remains broken. At the site, many people feel heartache when they think about the horrors of war. Visitors can also see the Bridge of Freedom, a bridge-turned-pathway. It is the only walkway that links the northern and southern banks of the Imjingang River. After the cease-fire agreement in 1953, 12,773 prisoners of war returned to the south by walking across this bridge. Imjingang Station has more to offer, in addition to the aforementioned sites. In the vicinity of the station there is also the Heyri Art Village, a community formed by artists and architects, the Provence Village collection of shops and coffee shops with the theme of art and design, as well as Paju Book City, a neighborhood established to focus on books, literature and publishing. The DMZ Train, opened earlier this month, runs to the west of Seoul, from Seoul Station to Dorasan Station. 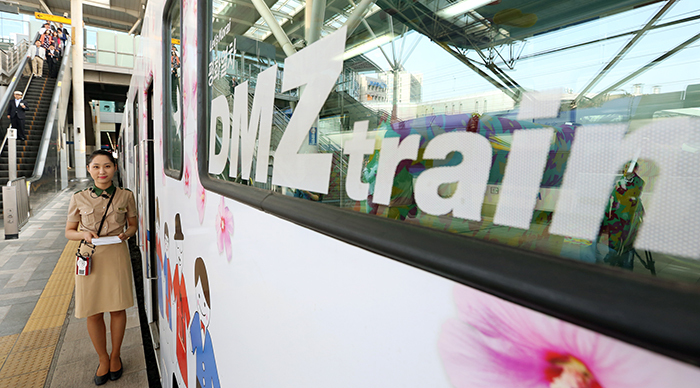 In the latter half of this year, a second DMZ tour train will begin operations. 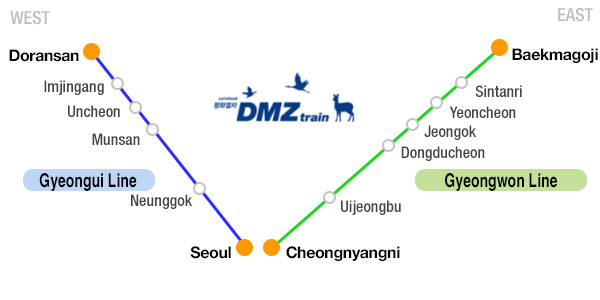 The second DMZ Train will depart Cheongnyangni Station and run northward to Baekmagoji Station. The DMZ, a region with untouched, pristine nature mixed with the nation’s saddest memories, can be reached by the DMZ Train. It runs every day except for Monday at 8:30 a.m. and 1:40 p.m. from Seoul Station. The price is 8,900 won on weekends and 8,700 won on weekdays. More information can be found at the KORAIL website.